January 22, 2014, Seattle, WA – Seattle wrongful death attorney Chris Davis of the Davis Law Group, P.S. has filed a lawsuit on behalf of the Estates of Robert and Elizabeth Rotta claiming that the Ohio State corporation First Transit Inc. and its bus driver acted recklessly and negligently by causing a significant bus collision with another driver. The collision killed Mr. and Mrs. Rotta, and severely injured their adult son, a commercial airline pilot, who was driving at the time. According to the lawsuit (Estate of Rotta vs. First Transit and Aleksander Rukhlin, 14-2-01840-1 SEA) filed in King County superior court, First Transit and its driver Aleksander Rukhlin violated traffic laws and failed to act in a reasonable and prudent manner by running a red light. On May 6, 2013, Rukhlin operated the bus owned by Sound Transit and was on a route through Kirkland, Washington. The bus was carrying approximately twenty-eight (28) passengers at the time of the collision. The bus had exited Interstate 405 by using the NE 128th Street HOV off-ramp toward the NE 128th Street overpass. The bus allegedly ran a red light at the controlled intersection on the overpass and crashed into the Rotta vehicle. Robert H. Rotta was killed instantly in the collision. Elizabeth Rotta later died at Harborview Medical Center from her injuries. The couple’s son, who was driving, was seriously injured but survived the crash. The bus driver stated at the scene that the brakes had failed, but passengers on the bus claim to have observed the driver using the accelerator pedal as the bus entered into the intersection and that he never used the brakes before the crash. 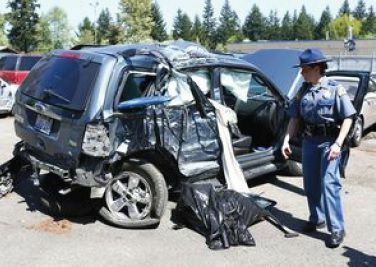 The Washington State Patrol (WSP) later performed an inspection of the bus and determined that the brakes, as well as all other mechanical and electrical components on the bus, were in proper working order at the time of the collision. The Rotta's lawsuit alleges that the crash was caused solely by the bus driver's own negligence when he failed to stop at the red light. The lawsuit specifically names First Transit, Inc as the defendant. The Washington State agency known as Sound Transit (also known as Washington State’s Central Puget Sound Regional Transit Authority) contracts with the Snohomish County agency known as Community Transit to provide bus transportation or common carrier services in the Puget Sound region. Community Transit then contracts with Ohio-based First Transit, Inc. to provide these same bus transportation and common carrier services in King and Snohomish Counties.